lipstick queen hot rose sinner: here. matte, full colour, moisturising, long wearing. there’s literally nothing wrong with this lipstick apart from my swatch, as it’s much brighter a la the space nk promo, which you can see here. MAC chatterbox: here. my go to pink when i’m in the mood to wear one. it’s a beautiful mid-toned blue pink (from their amplified range), which always looks nice on and i’ll definitely repurchase when it runs out. 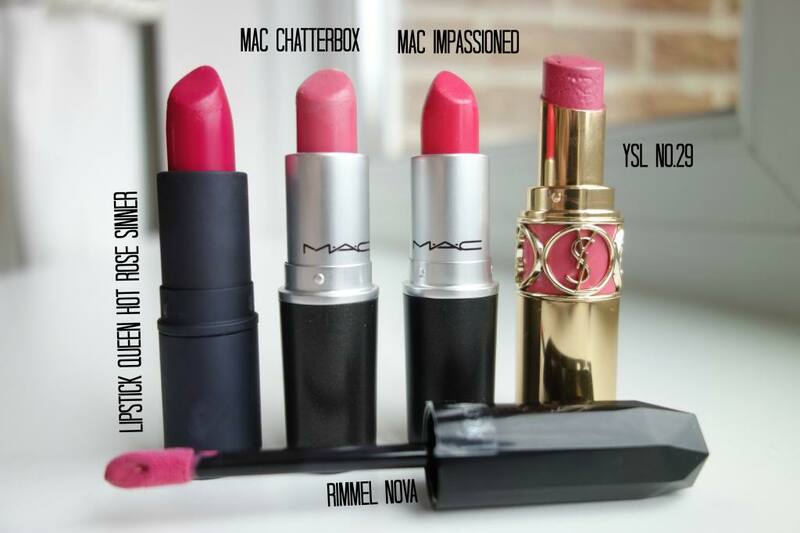 MAC impassioned: here. i’ve only worn this a handful of times as it is one of the brightest from their amplified range (along with girl about town, which i would have added to this list if i could find it!) but i absolutely love it. YSL rouge volupte no.29 rose opera: here. 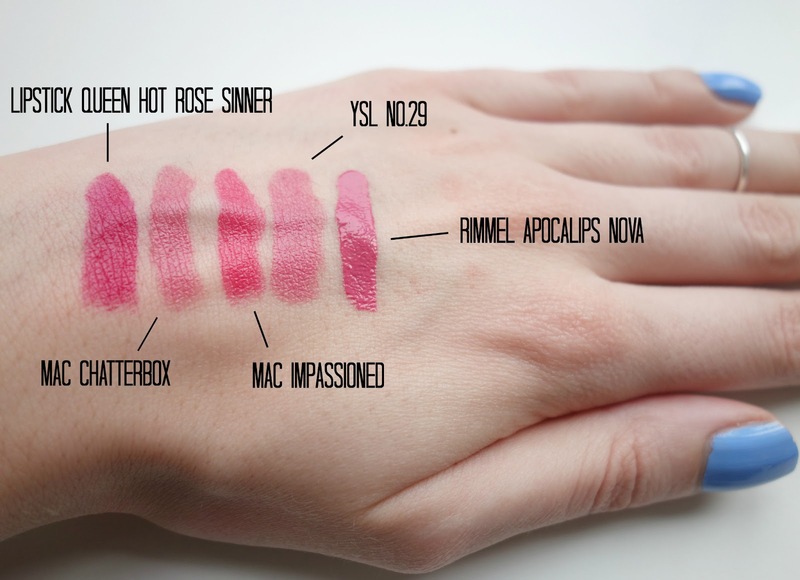 i have a love/hate relationship with these lipsticks as i adore the colours and how creamy they are. unfortunately, due to their lovely moisturising properties, they don’t last very long on the lips. buuut, sometimes i don’t mind re-applying as i like how they look! rimmel apocalips in nova: here. am i bored to death of reading apocalips reviews? yes. do i like them? yeaaah, go on. they’re nice to shove on when you don’t know what to go for, last quite well and are comfortable to wear. my only issue with them is that you have to have super moisturised, scrubbed to death lips or they’ll highlight any dryness. 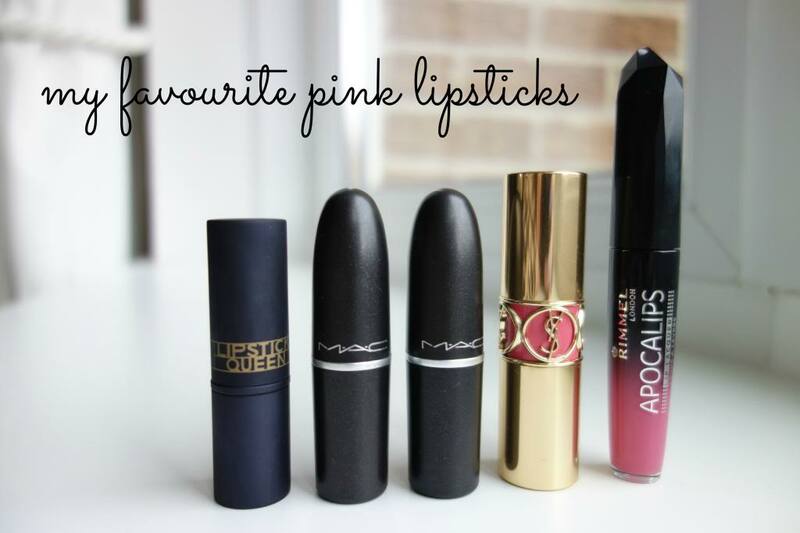 what’s your favourite pink lipstick? let me know! ps. make sure you check out the lovely georgia’s blog! check out my sponsors for this month: what’s in her wardrobe which is gemma’s personal style + beauty blog // ohellabella, which is daniela’s amazing beauty + style blog // kerralina which is kerry’s personal blog // and trina wears, which is a fantastic personal style blog!